People having windows 8, may enjoy a new experience in windows. It`s a touch experience, the modern user environment feels as good. But, most of encounter a hard feeling, While we miss our windows friend. I am here to say about START button. Switch over to non-Start button version of windows is a difficult job. Most of the users felt unhappy with this. So, now Microsoft released an improved version on windows 8 that is called windows 8.1. In this version, they bring Start button back. And as they improve some features in it. Before you install the Windows 8.1 Preview, it is also highly recommended that you backup any files you have on your PC or tablet first. Please see the Windows 8.1 Preview FAQ before installing. For Windows 8 users, it includes information on how to go back to Windows 8 if you need to. 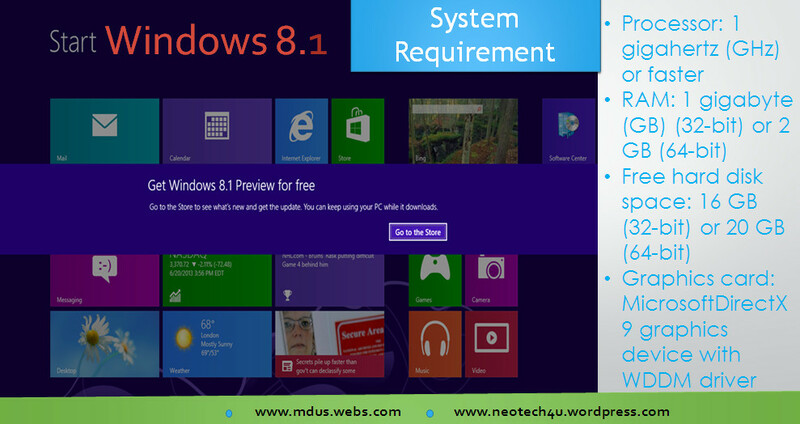 There are certain cases in which you will not be able to go back to Windows 8 after installing the Windows 8.1 Preview. So please read the FAQ before proceeding. Please note: If you are on Windows RT and have installed a language pack, please don’t install the Windows RT 8.1 Preview at this time. A fix is coming so check back soon. Windows RT 8.1 Preview requires that you have a PC already running Windows RT with 10 GB of free storage space. To access the Windows Store and to download and run apps, you need an active Internet connection, a screen resolution of at least 1024 x 768, and a Microsoft account. Windows will check your system’s eligibility before you update to make sure your system can support Windows 8.1 Preview. If you’re running Windows 8 in one of the 13 languages that the preview is available in, we strongly recommend that you download the preview from the Windows Store. When you install from the Store, you can’t create installation media but must download the preview directly from the Windows Store. If you’re running Windows RT, the only way you can update is through the Store. To see if you can update through the Store, see Download Windows 8.1 Preview. If you’re running Windows 8 and you don’t use any of the 13 languages the preview is available in, you’ll need to install using the ISO. If you’re running Windows 8 Enterprise, you’ll need to install the preview using the ISO. 2. Create a bootable DVD or USB flash drive to install Windows 8.1 Preview. If you need to update your firmware or drivers during the installation, you should install all required updates from Windows Update. If you need to free up disk space during the installation, consider copying files to a USB flash drive or uninstalling apps that take up a lot of space. If you start to get Windows 8.1 Preview but decide to stop, make sure you uninstall the associated Windows Update. Open Control Panel and search for View installed updates. Look for the Microsoft Windows category and then uninstall KB2849636.